The Havanese is an entertaining, playful, happy, gentle, and affectionate dog. He is very attentive and will find a high place on the furniture to watch you and what you are doing. He loves to do tricks and show off for you--he likes to be the center of attention! He becomes very attached to his owner, and needs lots of human companionship. He is not a dog who should be left alone for very long. He's friendly and likes people, and is easygoing and polite with guests. He is a fairly good watchdog because he will bark when he sees a stranger, but will quickly look to you for a signal to stop barking and go and make friends. He is well-mannered with other dogs, cats and pets. He is a trainable dog who likes to learn things and is responsive and obedient; he should have some training to make sure he doesn't get too bossy. He is sensitive to harsh words and tones, and is best taught with gentle persistence. He can be difficult to housebreak. He is an indoor dog who is very active and playful inside the house, and loves to play with his squeaky toys on the carpet. He's less active outside, although he does need a regular leashed walk or a nice romp in the yard. He loves children and is very good and playful with them. He virtually doesn't shed, and so would be a good pet if you are a clean-freak. 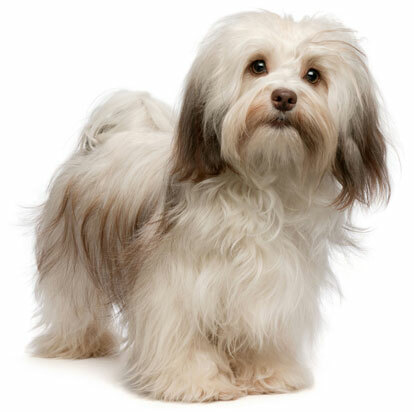 The Havanese is 8 to 11 inches tall (to shoulders) and weighs 7 to 13 pounds. He has a long, double coat that is wavy and soft, with the outer coat a bit coarser but still soft to touch. His coat can be any color: black, brown, white, gold, gray, or a mixture of colors. Pet coat: He only needs to be brushed and combed occasionally because a short pet coat won't matt or tangle. Clipped short every few months. Show coat: Should be brushed and combed for 10 to 15 minutes daily to prevent matting and tangling and trimmed every 6 weeks. The Havanese is the national dog of Cuba and its only native breed. He probably arrived with Spanish colonists in the 16th century, and was eventually adopted by wealthy Cuban landowners and elites. Following the Cuban Revolution in 1959, escaping exiles brought their Havanese dogs to the United States, and eleven dogs were used to rebuild the breed in America. The Havanese was admitted to the AKC in 1995. His AKC popularity was 37th out of 157 breeds in 2007.